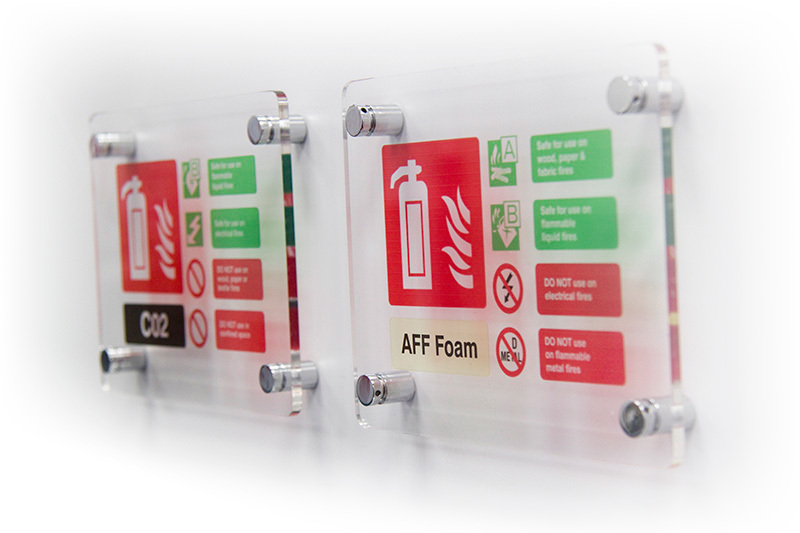 It is important to install fire safety signage in every workplaces, school and public building to give easy visual guidance to help people quickly identify the location of fire exits, alarms and equipment. Realm Fire & Security can help you install the correct safety signs in the appropriate locations. Under the Fire Safety (Scotland) Regulations 2006 together with the Health & Safety (Safety Signs) & Signals Regulations it is also a legal requirement for public buildings, and any to which the general public or customers have access, to display fire safety signs, so it’s essential to know what types of fire signage are available and which types you require for your business premises. 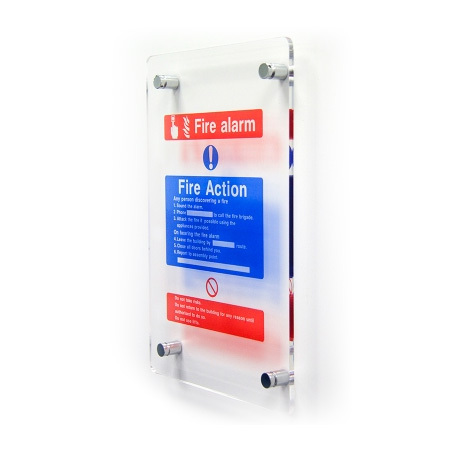 Realm Fire & Security can provide high-quality safety signs that are printed on clear Acrylic. They are mounted on display polished aluminium brackets. We have visual pleasing safety signs that can be bespoke for your company, for instance: special wording to where the assembly point maybe locate at your premises. 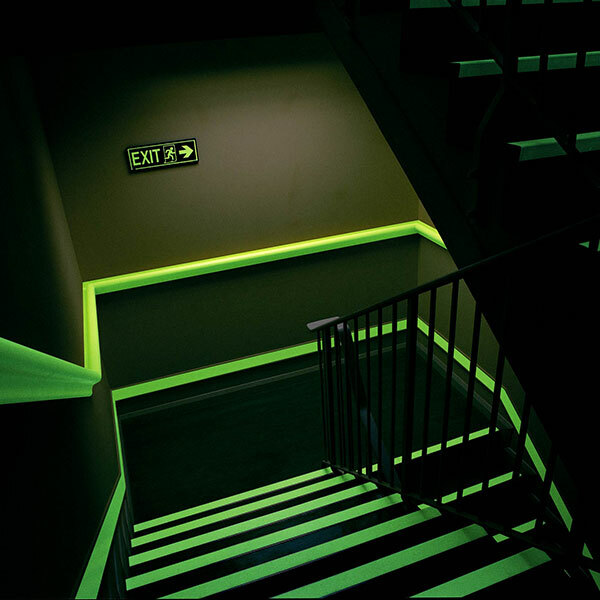 The Health and Safety (Safety Signs and Signals) regulations 1996 require that adequate provision of exit and safety signs be provided and which are to be illuminated by emergency lighting. Emergency Lighting is a safety feature in most buildings providing the instant lighting required should normal lighting fail or the mains supply be interrupted. Realm Fire & Security design, supply, install and commission emergency light systems in compliance with BS 5266, which provides detailed guidance on where luminaries should be installed. The levels of luminance omitted and require that the luminaries illuminate for a 3-hour duration after a failure of the normal lighting. 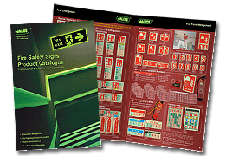 BS 5499-4:2000 Safety signs, including fire safety signs. Code of practice for escape route signing. Recommendations and guidance on the selection and use of escape route signs. This British Standard satisfies the requirements of the Health and Safety (Safety Signs and Signals) Regulations 1996 and existing fire safety legislation. It gives advice on the use of the appropriate graphical symbol, the use of supplementary text to assist in the interpretation of signs and the use of arrows to provide additional directional information. This standard does not stipulate if and when escape route signs will be required. This standard applies to premises where the formal risk assessment carried out under the management of health and safety, and in particular, The Fire Precautions (Workplace) Regulations as amended, has indicated a need for escape route signs to form an integral part of normal working procedures. This standard assumes that the risk assessment or the requirement of an enforcing authority has established a need for escape route signing. This standard is intended to cover the use of escape route signing systems within premises. This standard provides recommendations for the selection of the appropriate type of sign, the location of signs, mounting positions, lighting and maintenance. The recommendations within this standard cover high-mounted signs. This standard does not cover determination of the need for escape route signing. More information if needed about safety signs. Realm Fire & Security can assist you to comply and offer the following services for all types of systems, even if we did not install these ourselves. BS 5266 and BS EN 50172 state that you must have your emergency lighting and illuminated escape route signs tested and inspected regularly.